 Making your dream tour a reality may be a lot less expensive than you think. 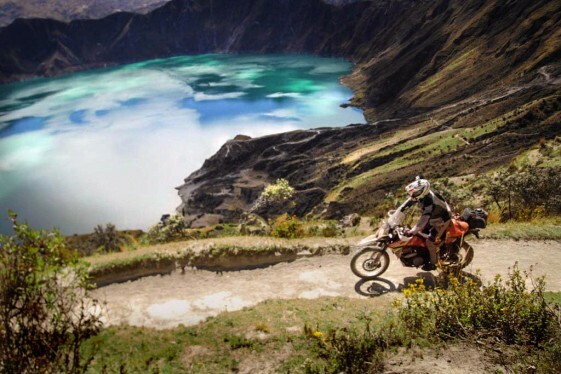 That bucket list Adventure Motorcycle Tour to South America could be more accessible than you think. Adventure Riders love talking about bucket list trips and South America is a destination that often comes up near the top of the list. It’s a region with a rich history, incredible cuisine and unbelievable landscapes that all come together to make it an ideal destination for an Adventure Motorcycle tour. More often than not though, conversations about touring South America end with “maybe someday” and no plans are made. The excuses start rolling about how it’s too far, too expensive or requires too much planning and time off. Well a South America motorcycle tour may be easier to achieve than you think, especially if you choose Ecuador as your entry point. Ecuador is a peaceful democratic nation with a diversity of landscapes that encapsulate every type of terrain available in South America — from pristine beaches to the Amazon jungle, rain forests and the high Andes mountains — and you can travel to them all with relative ease on a motorcycle. One of the best things about Ecuador though is that it’s cheap! Ecuador’s official currency is the US dollar and a dollar goes a lot further in Ecuador than it does in the states. A decent hotel costs about $10 per person, a three-course meal with a drink is around $3 and a gallon of regular gas costs about $1.50. Getting to the country isn’t so bad either. Flights from Los Angeles, Houston, Miami or New York can range from $500 to $600 round trip, and it’s only a four- to five-hour flight from Miami or Houston if you fly nonstop. 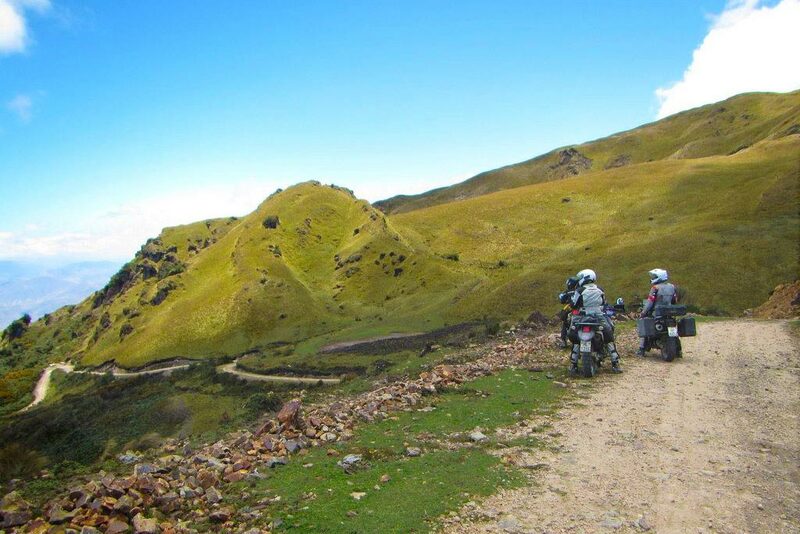 Don’t have time to plan a South American motorcycle tour? Using a tour company can make things a lot easier. 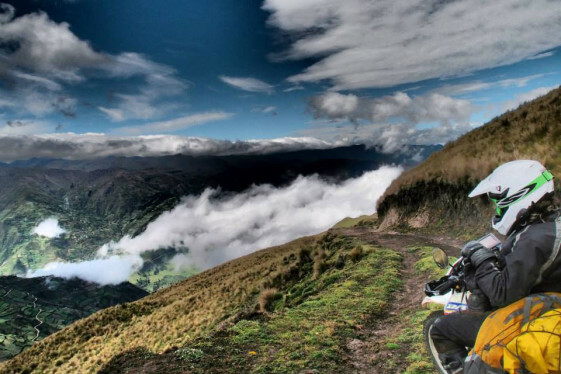 One company we discovered with a range of affordable tour options is Ecuador’s top Motorcycle tour company, Ecuador Freedom. With their local knowledge, they can set you up with top hotels and restaurants for your trip and provide you with an itinerary that takes you to see some of the best Ecuador has to offer. 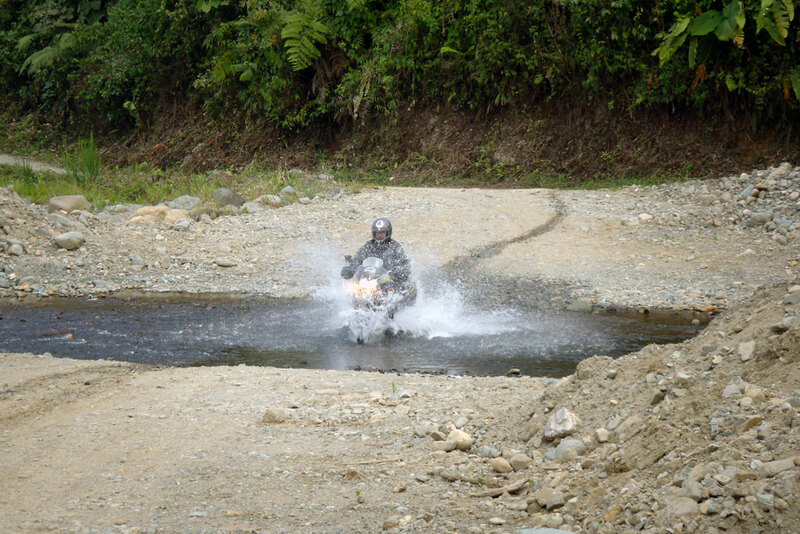 A tour that is perfect for Adventure Riders on a budget is Ecuador Freedom’s “Offroad Ecuador Self Guided GPS Tour.” It’s a four-day 575-mile off-road adventure that takes you deep into Ecuador’s back country on dirt roads, allowing you to immerse yourself in the region’s unspoiled natural treasures. It’s a tour for those that like to get far away from the tourist crowds and visit places most people rarely see. Just because it’s an off-road tour doesn’t mean you have to rough it though. Ecuador Freedom makes all your reservations and payments with the top hotels (three to five stars) along the route and give you an itinerary to follow with recommended stops for your trip. You choose from ten different models of well-maintained dual sport motorcycles that include, DRs, KLRs, Triumphs, Huskys, BMWs and KTMs. All the bikes in their fleet are equipped with luggage systems, pre-programmed GPS, tools, spares, first aid kit, emergency cell phone and 24-hour roadside assistance. They can even set you up with gear. And since it is a “Self Guided” tour, you get to ride at your own pace and be more spontaneous. You also don’t have to plan your trip around a scheduled tour date. Just reserve your self-guided tour when it’s convenient for you to travel. The four-day Offroad Ecuador Self Guided GPS Tour starts at $990 with Hotels, taxes and several meals included in the price. In addition, if you invite your riding buddies, your group will save $50 for each additional person that joins you. Conceivably, you could fly in to Ecuador on a Tuesday morning and return home on Sunday night, only missing four days of work. If you figure in all your costs for the trip, including a flight, fuel costs, taxi to and from the airport, meals and miscellaneous tolls and entrance fees, a bucket list trip like this one can be achieved on a total budget of around $1,650. Check out the Ecuador Freedom Bike Rental and Tours website. With a wide range of affordable motorcycle tours, both self-guided and guided, they make it easy to scratch South America off your bucket list. I must do this! no excuses. Very interesting. Was hoping to read about more than just Ecuador (South American bucket list ride), but this was some good info. Great article! I had no idea it could be so affordable. Ive had a deep longing to do something like this for years. Looks like it is well within reach. Is there a best time to go? Since Ecuador is at the equator, there is very little seasonal variation. Weather is dictated more by elevation and in a single day’s ride, you can experience all four seasons. To save money on flights, try to plan your trip around peak times. Peak times are when Ecuadorians living abroad come home to visit their families. These times are mid-December through mid-January and the first week of April (Easter week). I did the 10 day tour self guided, end of March, 1st week of April. That is the rainy season, got very wet a few days, missed a few things, ( I’ll have to do it again) and still had the experience of a lifetime! I just checked their web site and hotel and taxes are NOT included. Also, the $990 starting price is for a 200cc bike. Still a great article and a great trip, just go in with eyes wide open on the costs. Hey Jeff, We just double-checked their website to see if anything had changed and everything is still the same. Foreigners DO NOT pay for taxes and all hotel accommodations are included during the tour. On top of that your group gets $50 off for each riding buddy that joins. Great trip for sure! Awesome article! I had no clue it could be so moderate. Ive had a profound aching to accomplish something like this for quite a long time. It would appear that it is well inside span. Exceptionally fascinating. Was wanting to peruse about more than just Ecuador (South American can list ride), however this was some great data. Where are the reviews from from folks who actually paid for these tours and did the ride? And now I have to give an email address to comment? I’m sure to get “reviews” from the tour operator now. Hope you get to make the trip!